Quaker Chewy Bars are one of those things that seem to be a staple in my life. They have no nutritional value, do not provide any substantial amount of filling and are pretty much a waste. Yet, I purchase them whenever they are on sale – pretty much all the time – and eat them regularly. Why that is, I really can’t answer. It’s like that one old t-shirt that you have had for forever and just simply can not get rid of. Quaker Chewy Bars are my old tshirt. They are my I Can’t Quit You item. I’m pretty sure I have tried every variety of Quaker Chewy Bar. I normally stick with the 25% Less Sugar Chocolate Chip but, I try new flavors when available. Last time they were BOGO at Publix, I bought a box of the Dipps Dark Chocolatey variety. While the Dipps bars are not new, this flavor was new. Taylor likes the original Dipps bars, in the fridge. I decided to stick one of these in the fridge and give it a while. While I am not a fan of the original ones – Chocolate Chip Chewy Bar dipped in Milk Chocolate – I was excited to try these. 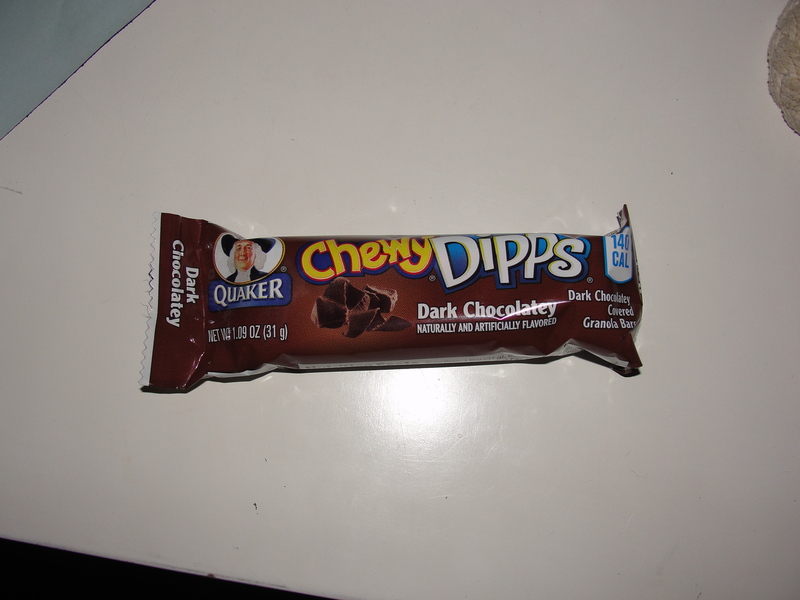 At first glance, this looks like a regular Dipps bar. But, once you break the bar apart, you find that the inside granola bar is also of a chocolate variety. I was intrigued and, after waiting a few hours for it in the fridge, ready to try it out. On first bite, I was digging the bar already. The exterior chocolate was just sweet enough and had a smooth consistency to it. 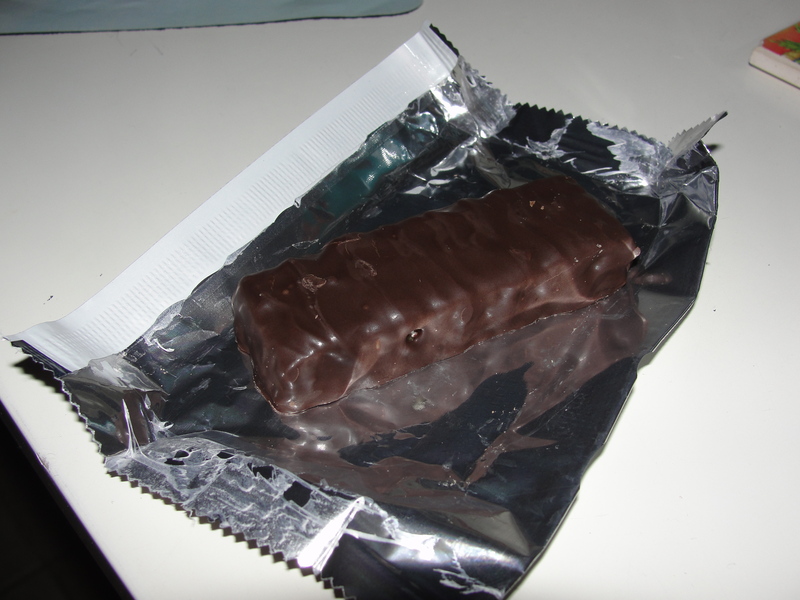 I really enjoyed the chocolate granola bar inside – I could taste the cocoa as I chewed it – simple yet there. The combination of this with the exterior chocolate, provided a chocolate pair that blended just perfectly. The flavors did not overpower each other nor did they scream sugar. It was simply a perfect union…a state of harmony. I ate the entire Chewy bar and loved it all. After Taylor tried these, he agree and liked them just as much. This bar is set apart by the fact that the interior is a chocolate granola bar. While they could have just stuck with the typical granola bar, Quaker mixed it up. The end product is great – flavors of cocoa and chocolate come pouring out of the bar and into your mouth. Quaker Chewy Bars are not leaving my life any time soon. I will always laugh at the fact that I still eat them but, if they keep producing bars that I enjoy, I simply will not be able to quit. And why quit a good thing anyways? We all need that one tshirt.